I had to wait a couple of weeks for a friend to send me this photo, hence the late blog post. Like a little kid in a candy shop, my eyes widened when I saw Bob Schieffer. He was at a Barnes & Noble in Dallas a couple of weeks ago to promote his new book, Bob Schieffer’s America. I’ve been fortunate enough to meet some amazing journalists throughout the years: Tom Brokaw, Gwen Ifill, Anne Hull, Tom French, Lane DeGregory, the late David Halberstam, and more. These journalists, and several others who haven’t reached the same level of recognition, have given me hope that quality journalism is still around, even if it’s getting harder to find. In giving me this hope, they’ve served as role models who I can look up to and try to emulate. 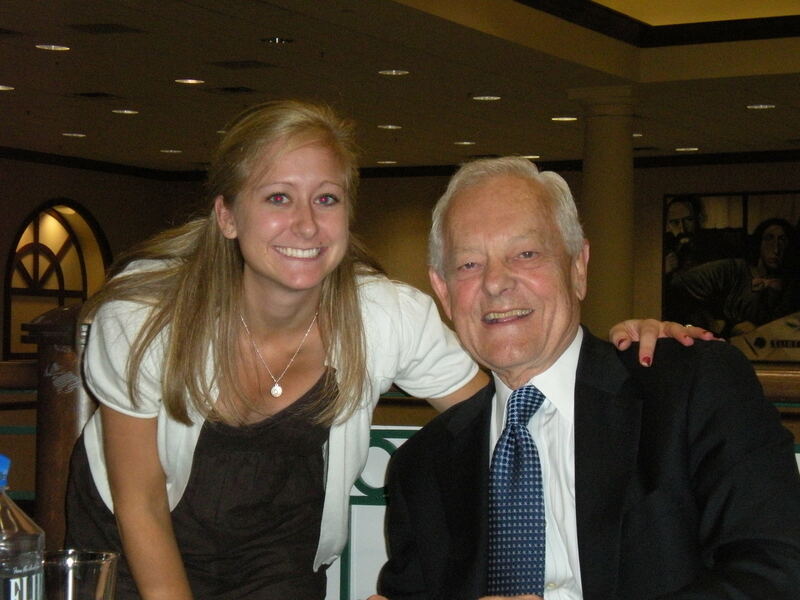 I’d say Bob Schieffer is a pretty good role model. The longtime journalist, who grew up in Austin, Texas, and worked as a reporter for the Fort Worth Star-Telegram, has won six Emmy awards, is in the Broadcasting/Cable Hall of Fame and in 2002 was named Broadcaster of the Year by the National Press Foundation. For all his accomplishments, he struck me as incredibly humble and fun-loving when he spoke at Barnes & Noble. He kept his talk short, focusing mostly on politics and his experiences as a journalist. He told the mostly white-haired crowd that of all the elections he has covered, the 2008 election is the most dynamic of them all. Because the race is so close, he predicted that this year’s debates will hold significantly more weight than those in years past. I posted this photo of me and Tom Brokaw just for fun. 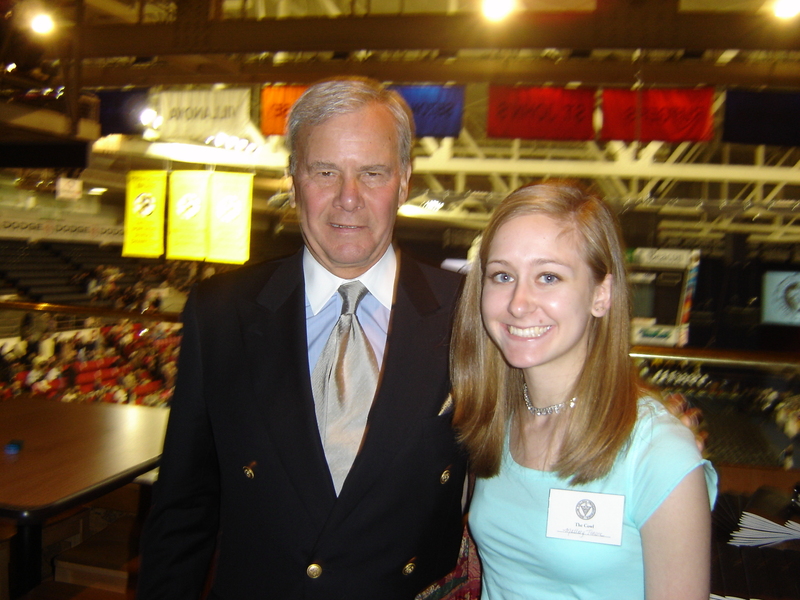 It was taken when Brokaw gave the 2005 commencement address at my alma mater, Providence College. After Schieffer shared his stories, I waited in line for an hour to take a photo and talk with him. I mentioned my experiences at The Dallas Morning News and at The Poynter Institute, which he visits about once a year as a member of the institute’s national advisory board. When my friend asked him about the future of journalism, he succinctly said that no matter what happens, there will always be a need for news. I smiled a lot when talking with Schieffer and didn’t bother hiding my kid-in-a-candy-shop excitement. These days, journalists need to hold onto every ounce of motivation they can get.